The role of making may seem self-evident in a design context. 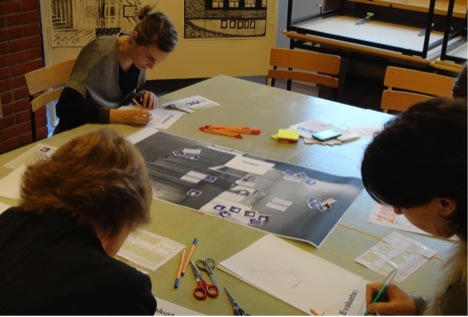 However, in developing an educational design research course at the Media, Arts and Design faculty (Genk, Belgium), we observed that students tend to lose their focus on making when design and research are intertwined. This paper reflects on a research trajectory that explores how to support students in intertwining making and reflecting throughout the design research process. During this trajectory, we redeveloped design research methods that make use of design representations – i.e. field studies, insights, experiments, prototypes and so on – as a means to connect making and reflecting. Design representations possess informative and inspirational qualities. They are produced by designers to open up their design process and enable communication, collaboration and reflection with others throughout the making process. We will argue that combining design representations with structuring rules of play in a design research method and using these representations throughout the whole design process can improve collaborative reflection-in-action (Schön, 1983), or reflection-in-making, since it allows students to work in a more iterative manner. Illustrated by eight case studies, we describe how we recreated and evaluated a design research method, making use of design representations and structuring rules of play.